He played in Shawn Lealos‘ Dollar Baby I Know What You Need as Shane. 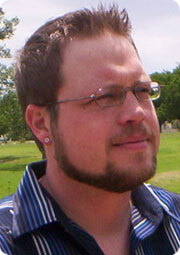 Robert McIlrath: My name is Robert McIlrath, I am 26 years old and currently reside in Norman, OK, USA. I am an actor and producer, working mainly with the company that I started with Shawn Lealos, Starving Dogs Productions. SKSM: How did you become involved in I Know What You Need? Robert McIlrath: Shawn found out about the Dollar Baby movies that Mr. King allows student filmmakers to make and I thought it would be a great film to produce. The best part of making I Know What You Need is not only is it a work of Mr. King’s, but it is a great showcase for student and independent filmmakers. This particular film not only showcased the great actors we had, but also Shawn’s ability to adapt a story into a screenplay. Robert McIlrath: This role was written for me for two reasons. 1. I have a bad case of the acting bug, and love to be in anything I can. 2. Shawn really wanted build more character depth in the story, therefore he add this character into the story to help Alice in her search about Edward. SKSM: You worked with Shawn Lealos on this film, how was that? Robert McIlrath: Shawn is an amazing director to work with. As an actor, he is very patient and understanding, while still being firm on what he sees as the character. As a producer, he makes working alot of fun. He has such an artistic vision when he steps behind the camera, and doesn’t settle for any thing less. Robert McIlrath: The funniest thing about the movie was Kevin Real. Kevin played Edward in the movie, and was so into the character, that he would start to scare people when he didn’t break character. SKSM: What did you do after I Know What You Need? Robert McIlrath: I’ve kept very busy since I Know What You Need. We have made three more films since the completion of IKWYN, where I have pulled double duty by producing and acting. Robert McIlrath: Of course I talk to Shawn on a daily basis. I also try to keep in touch with Kevin Real and Colin Warde. They are both great actors and I look forward to working with them again, hopefully on our first feature film at the end of 2006. SKSM: Voodoo is an important part of the story. Do you believe in it, or did you have personal experience with voodoo? Robert McIlrath: I have not had any experiences with voodoo, but would like to learn more about it. I try to keep an open mind about everything, I just have never had any dealings with it. Robert McIlrath: I am a very big fan of Mr. King’s. I think he is one of the most intelligent writers of all time and I think his accomplishments speak for themselves. My personal favorite is It, book and movie. Robert McIlrath: I just hope everyone that had a chance to see the movie liked it, and now that we a score completed, I hope more people get a chance to see it. We will be sending IKWYN to many more film festivals in the upcoming months and will try to keep everyone posted.